2018-01-22. Published in category Articles. Music is therapy. Music is meditation. Music is an exercise in discipline. But most of all music is freedom. Music has the same color as the air. You can close your eyes but you can’t close your ears. If you play it well,that’s the only thing that matters. Being a young Southern girl I of course had to learn to play the piano. The boys got guitars and drums and it seemed much more fun. They were out on the porch playing,having a ball. I wanted one! My mother got me a guitar, and not long after she passed away from an aneurism...And I will play guitar until I leave this world. We didn’t have a piano in our home. I grew up in a small rural neighborhood with a great piano teacher, and I had to go to practice at the teacher’s house. The boys were learning and listening to records and radio.The guitar just seemed far more accessible. The first time I played a gig and made money in a club is where I realized that I could have fun AND get paid. “I can do this and make money?” I got much more than my weekly allowance. I’m the oldest of seven siblings so I fell in love with the group dynamics of a band.After high school,I went to university and formally studied classical voice and guitar and music education. The professional female musicians I've worked with share a similar feeling as I did growing up playing music-that they had to be twice as prepared,driven and focused to be taken serious in the music industry.I think we,as women, bring heart and soul and patience, and there isn't a big of competition between us. We are focused yet enjoy playing. Our hearts and ears are open and open for suggestions as well. A lot of organizations will hire a woman for the optics. If she looks good the- wow-wow!! You have to look good in the industry, but you need to know how to play too, although some organizations may not care about their skill set. Sharing an anecdote or two I was working with Colin James, who was a protege of Stevie Ray Vaughan He traveled to work for SRV saying “I’ll be your tech for free,just teach me...At one point. I was backstage with Colin and an incredible group of artists at the end of a festival, and among them was B.B. King. He shook my hand and my hand disappeared in his gigantic hand. He let my touch Lucille. He seemed to have telephone wires on that guitar. You had to manhandle that thing. He was about make a speech at a college where he was to be honored, and he asked me 'What am I going to tell them'? perplexed by the invitation.He was so down to earth and so gentlemanly . I asked him “Don't you know who you are to us? He was talking to me like a daughter...supercool! I was introduced to Bernie Worrell by Felicia Collins. The recording session with him was like a big party, but he was cool and serious ..and so focused, with a spirit so free. He said “Do what you feel – just make it funky! I am selective about answering Prince questions.Usually I can sense if they come from a good place or not. When I first met him,he asked me who I listen to. I told him that I listened to Jeff Lee Johnson and John Scofield ,for example at the time, and to Wes Montgomery as a constant go-to,melodically. What he did on stage depended on his musical vision for each tour and changed constantly. He rotated instruments,as he mastered many. Every band had a different make up and purpose. At one point he asked me what I thought he should add to the set we were working on.i suggested adding an unplugged section;just sit with a guitar and do a few songs...He laughed and responded that that would be so boring, but a while later..he finally did it, and people loved it, and he wound up doing a lot of it. Right now my band ROCKSUGAH will be the house band at the She Rocks Awards 2018 at the NAMM Show with Divinity Roxx among others, which we do every year. 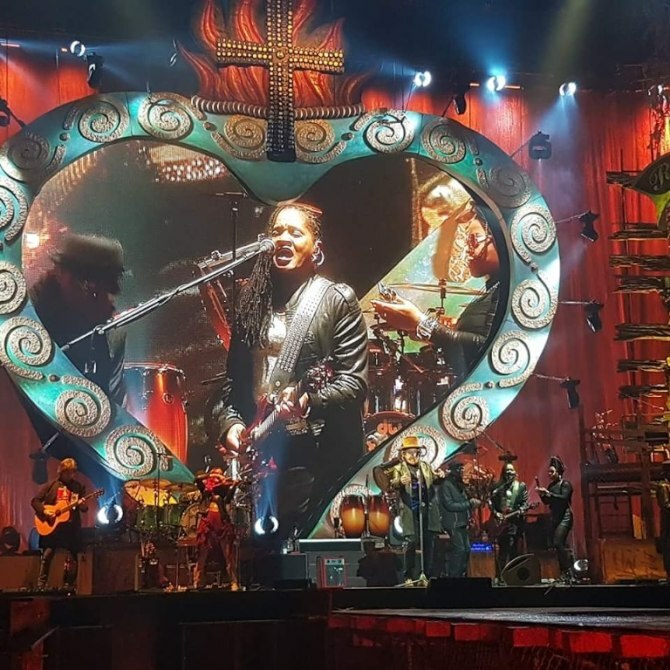 After that I will do a special Valentine’s show with Gary Taylor and Najee before I go on tour with my Italian boss Zucchero. In March I’m doing the Black Women Rock event (BWR)in Detroit,which is run by Jessica Care Moore.It honors women of color in rock and alternative music. This year we will honor the great Nona Hendryx, whom I can't wait to work with again.We will also bring BWR to the West Coast in May. In April,I take part in the Prince celebrations in Minneapolis . 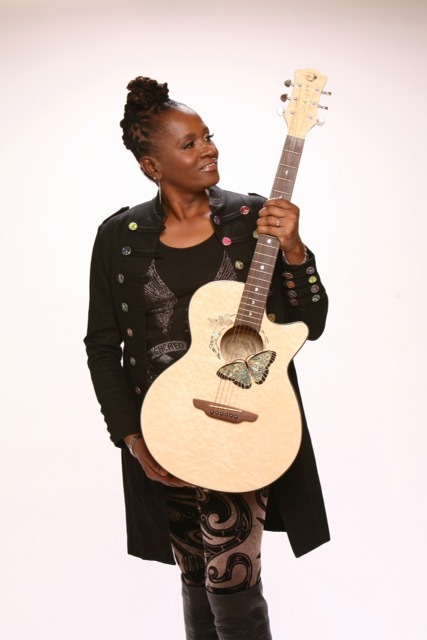 Kat Dyson is a a guitarist and singer, who has worked with a long list of fellow artists, a list that includes Cyndi Lauper, Natalie Cole, Ivan Neville, Keb Mo, Mick Jagger, Dave Stewart, Jeff Healey, Bernie Worrell, Prince, Donny Osmond, T.I., Seal, Sheila E, Joi, George Clinton and the P-Funk AllStars, MusiqueSoulchild, Phoebe Snow, Res, The Winans, Mary Mary, Yolanda Adams, Big Mamma Thornton, Ben E. King, Bo Diddley, and Odetta.